سعادت, رحمان, ابونوری, اسمعیل, بکی حسکویی, مرتضی, زارع, محمد حسن. (1396). اثرات رفاهی پیوستن ایران به سازمان جهانی تجارت در چارچوب مدل تعادل عمومی قابل محاسبه پویا. پژوهشنامه بازرگانی, 21(84), 131-168. رحمان سعادت; اسمعیل ابونوری; مرتضی بکی حسکویی; محمد حسن زارع. "اثرات رفاهی پیوستن ایران به سازمان جهانی تجارت در چارچوب مدل تعادل عمومی قابل محاسبه پویا". پژوهشنامه بازرگانی, 21, 84, 1396, 131-168. سعادت, رحمان, ابونوری, اسمعیل, بکی حسکویی, مرتضی, زارع, محمد حسن. (1396). 'اثرات رفاهی پیوستن ایران به سازمان جهانی تجارت در چارچوب مدل تعادل عمومی قابل محاسبه پویا', پژوهشنامه بازرگانی, 21(84), pp. 131-168. سعادت, رحمان, ابونوری, اسمعیل, بکی حسکویی, مرتضی, زارع, محمد حسن. اثرات رفاهی پیوستن ایران به سازمان جهانی تجارت در چارچوب مدل تعادل عمومی قابل محاسبه پویا. پژوهشنامه بازرگانی, 1396; 21(84): 131-168. در این مقاله به بررسی اثرات بلندمدت رفاهی پیوستن ایران به سازمان جهانی تجارت با استفاده از یک مدل تعادل عمومی پویا پرداخته است. به این منظور، ابتدا مدل بر مبنای ماتریس حسابداری اجتماعی سال 1390 کالیبره شده و سپس، مدل برای سناریوی پایه و سناریوی رقیب ــ به معنای کاهش تعرفه‌ها به سطح میانگین تعرفه‌های 22 کشور درحال‌توسعه ملحق شده به سازمان ــ شبیه‌سازی شده است. همچنین، براساس نتایج به‌دست‌آمد، در یک افق بلندمدت سی ساله، سطح رفاه خانوارها در تمام سال‌های پس از الحاق، در مقایسه با قبل از الحاق، افزایش یافته، اما در دهه‌ اول پس از الحاق، نرخ رشد رفاه نسبت به قبل از الحاق، روندی نزولی دارد و روند افزایشی رفاه نیز، از دهه سوم پس از الحاق آغاز می‌شود. 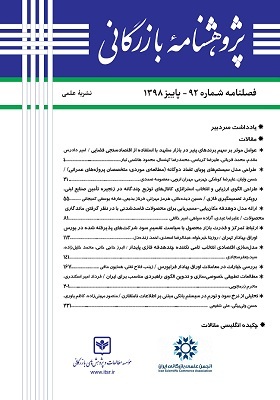 2Professor of Econometric &amp; Social Statistics, Department of Economics, Semnan University, Semnan-Iran. 3Assistant Professor of Economics and Head of Economic Modeling Department of Economics, Imam sadegh University, Tehran-Iran. 4PhD Student of Economics, Department of Economics, Semnan University, Semnan-Iran. In this paper, Using Dynamic Computable General Equilibrium (DCGE), the long run welfare effects of Iran's accession to the WTO has been analyzed. Doing so, at the first stage, the model is calibrated using the data base of 2011 Social Accounting Matrix (SAM). Next, the model is simulated for the Business as Usual (BaU) and rival scenarios. The recent scenario is developed on the basis of the market access commitments of 22 developing countries acceded to the WTO after the establishment of the organization in 1995. The results indicate that membership to the WTO; will increase the level of the household welfare. However, during the first decade after accession, the rate of increase in household welfare decreases. Increasing trend of household welfare initiates in the third decade after accession to the WTO. برفیشر، ماری (1392)؛ مقدمه‌ای بر مدل‌های تعادل عمومی قابل‌محاسبه، ترجمه فاطمه بزازان، تهران: نشر نی. برقی اسکویی (1394)؛ «تأثیر کاهش نرخ تعرفه کالاهای وارداتی بر بازار کار ایران (مطالعه موردی: بخش کشاورزی و بخش صنایع غذایی، پوشاک و نساجی)»، فصلنامه مدل‌سازی اقتصادی، دوره 9، ش. 32، صص40-25. پایگاه داده‌های مرکز آمار ایران، بانک مرکزی و گمرک جمهوری اسلامی ایران. سلامی (1379)؛ «آثار اقتصادی پیوستن ایران به WTO بر بخش کشاورزی»، رساله کارشناسی ارشد، دانشکده اقتصاد دانشگاه تهران. ذوقی‌پور آمنه و منصور زیبایی (1388)؛ «بررسی اثرات آزادسازی تجاری بر بخش‌های اقتصادی ایران: مدل تعادل عمومی قابل محاسبه»، نشریه پژوهش‌های اقتصادی، دوره 9، ش. 3، صص 138-113. رجایی لیتکوهی، محمدهادی (1390)؛ «اثر تکانه قیمت انرژی بر تولید و تورم در اقتصاد ایران با استفاده از الگوی تعادل عمومی پویای اقتصادی»، رساله دکترا، تحت راهنمایی دکتر اسمعیل ابونوری، دانشکده اقتصاد و علوم اداری دانشگاه مازندران. طیبی، سیدکمیل و شیرین مصری‌نژاد (1386)؛ «آزادسازی تجاری بخش کشاورزی و کاربرد مدل‌های تعادل عمومی قابل محاسبه: مطالعه خانوارهای ایرانی»، فصلنامه بررسی‌های اقتصادی، ش. 1، صص23-5. لافگرن، هانس و دیگران (1390)؛ مدل تعادل عمومی محاسبه‌پذیر برنامه‌نویسی در GAMS، ترجمه مهدکی شهرکی و سیمین قادری، تهران: نشر نور علم. مهرگان، نادر و سجاد برخورداری (1389)؛ مدل‌های تعادل عمومی قابل محاسبه و کاربرد آن‌ها در اقتصاد، تهران: نشر نور علم. مصری‌نژاد، شیرین (پاییز و زمستان 1389)؛ «آزادسازی تجاری و رقابت‌پذیری بین‌المللی در ایران: کاربرد مدل تعادل عمومی قابل محاسبه»، نشریه مطالعات اقتصاد بین‌الملل، دوره 21، ش. 2 (پیاپی 37)، صص 116-101. ناظمان، حمید و مرتضی بکی حسکویی (زمستان 1388)؛ «تخصیص بهینه درآمدهای نفتی در قالب یک مدل تعادل عمومی پویا»، دوره 6، ش. 4 (پیاپی 23)، صص 28-1. نیک منش، لیدا (1385)؛ «بررسی اثرات آزادسازی تجاری بر بازار نیروی کار در ایران: الگوی تعادل عمومی کاربردی»، رساله کارشناسی ارشد به راهنمایی موسوی محسنی، دانشگاه شیراز. Annabi et al. (2005); Trade Liberalization, Growth and Poverty in Senegal: A Dynamic Micro simulation CGE Model Analysis, Center Detudes Prospective Et Disinformation's Internationale (CEPII). Ayoki, Milton (2013). Trade Policies and Poverty in Uganda: A Computable General Equilibrium Micro Simulation Analysis, Nairobi: African Economic Research Consortium. Bacchetta, M (2003); “Introduction to the WTO”, World Bank and WTO course, World Bank. Bagwell, Kyle and Robert Staiger (2003, Fall); “Economic Theory and the Interpretation of GATT/WTO”, The American Economist. Carniro, F.G. & Arbache, J.S. (2003). “The Impacts of Trade on the Brazilian Labor Market: A CGE Model Approach”, World Development, no.31(9), pp.1581-1595. Chen, Shaohua and Martin Ravallion (2004). “Welfare Impact of China Accession to the WTO”, The World Bank Economic Review, vol. 18, no. 1. Cling Jean-pierre (2009). “The Distributive Impact of Vietnam’s Accession to the WTO”, Economie Internationale, pp.43-71. Decaluwe et al. (2010); “Computable General Equilibrium Model Single Country, Recursive Dynamic Version, Poverty and Economic Policy (PEP)” Research Network, pp.11-55. Deng, Ziliang (2013); “Quantifying Foreign Direct Investment Productivity Spillovers in China: A Computable General Equilibrium Model”, Asian Economic Journal, no.27(4), pp.369-389. De Santis, Roberto A. (2002); “A Computable General Equilibrium Model for Open Economy with Imperfect Competition and Product Differentiation”, Journal of Economic Integration, no.17(2), pp.311-338. Dutt, Pushan (2013); “The Effect of the WTO on the Extensive and Intensive Margins of Trade”, Journal of International Economics, no.91, pp.204-219. Eromenko, Igor (2010); “Accession to the WTO, Computable General Equilibrium Analysis: the Case of Ukraine”, Munich Personal Repe Archive (MPRA). Fan, Mingtai and Yuxin Zheng (2005); The Impact of China Trade Liberalization for WTO Accession: A Computable general Equilibrium Analysis, Beijing: Institute of Quantitative & Technical Economics, Chinese academy of Social Science. Ghosh, Madanmohan and S. Rao (2010); “Chinese Accession to the WTO: Economic Implications for China, Other Asian and North American Economies”, Journal of Policy Modeling, no.32, pp.388-398. Hertel, Thomas W. and L. Alen Winters (2005); Poverty Impacts of a WTO Agreement: Synthesis and Overview, Washington D.C: The World Bank. Hosoe, Nobuhiro et al. (2010); Textbook of Computable General Equilibrium Modeling, Programming and Simulations, England: Palgrave Macmilan. Ivus, Olena and Aoran Strong (2010); “Modeling Approaches to the Analysis of Trade Policy: Computable General Equilibrium and Gravity Models”, Handbook on International Trade Policy. Johnson, Harry G (1953); “Optimum Tariffs and Retaliation”, Review of Economic Studies, vol. 21, no. 2. Khatibi, Arastou (2008); “Kazakhstan’s Accession to the WTO: A Quantitative Assessment”, Brussels: Research Associate of ECIPE. Khondker, Bazlul H. and Selim Raihan (2004); Welfare and Poverty Impacts of Policy Reforms in Bangladesh: A General Equilibrium Approach, Bangladesh: University of Dhaka, Department of Economics. Kirkpatrick, Colin and Serban Scrieciu (2007); The Computable General Equilibrium Approach to Assessing the Poverty Impact of Trade Liberalization, University of Manchester, Institute for Development Policy and Management. Liu, Xiahe et al (2007); “Agricultural Trade Liberalization and Poverty in CHINA: Linked CGE Model Analysis”, Presentation at IATRC Conference Held in Beijing China on July 7-9 th. Lofgren, H., lee, R. and Robinson, S (2002); A Standard Computable General Equilibrium (CGE) Model in GAMS, International Food Policy Research Institute. Morely, Samuel and Valeria Pinerio (2004); The Effect of WTO and FTAA on Agriculture and the Rural Sector in Latin America, Washington, D.C: International Food Policy Research Institute. Omolo, Martin W.O (2011); The Impact of Trade Liberalization on Poverty in Kenya, Nairobi: Institute of Economic Affairs. Rutherford, Thomas (2005); Poverty Effect of Russia’s WTO Accession: Modeling Real Household and Endogenous Productivity Effects, World Bank Policy Research Working Paper. Salvatore, Dominick (2013); International Economics, 11th ed, the US of America: Fordham University.